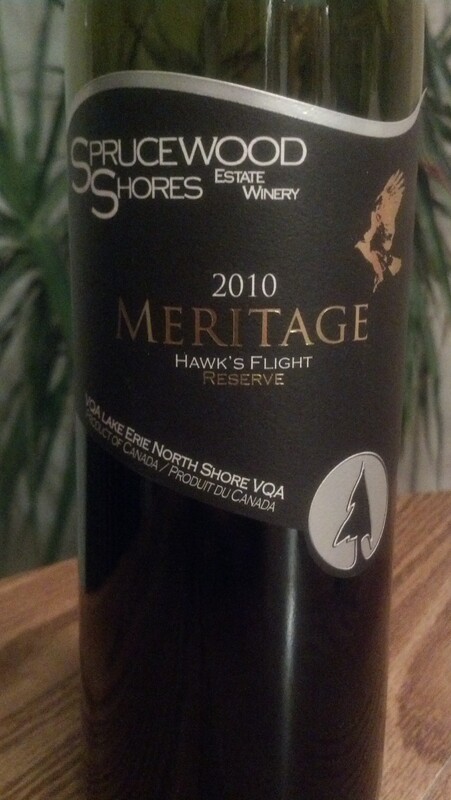 2010 Sprucewood Shores Meritage Hawk’s Flight Reserve | Wine Splash! Dedicated to the Hawks migration across Southwestern Canada, this red blend is just as exciting! A sumptuous Bordeaux blend of Merlot, Cabernet Sauvignon, and Cabernet Franc will make your senses take flight. Deep garnet in color with aroma’s of ripe red berries, red licorice, and cedar. Across the palate, full bodied and bold but with a nice velvety texture. Flavors of bright red plums, raspberries, and cedar. On the second sip, flavors of vanilla and a hint of smoke emerged. A lush, lingering finish with a wonderful balance of fruit flavors and tannins. Pair with beef, pasta with tomato sauce, barbecue pork, and medium to sharp cheeses. A fun and flavorful wine from a winery worth checking out if along the Erie Shore near Harrow, Ontario. 90 Points! WineSplashing! !